SERVPRO is the leader in the water mitigation industry. Generally speaking, when we lay eyes on something we can tell if it will be able to be salvaged. In this case, this paneled wall is too far gone and will need to be replaced. Heavy rains can cause more damage than you might think. 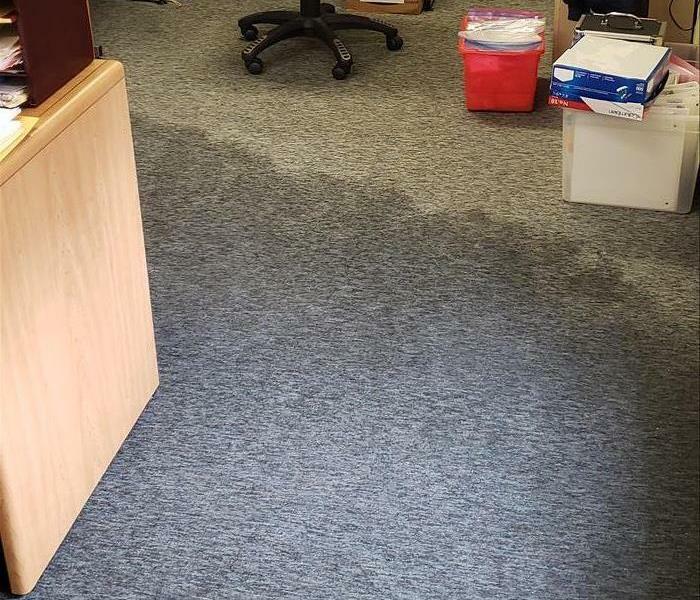 In this picture, a storm blew a lot of rainwater under the front door of the building soaking the carpets in the office. In this photo, you can see what the industry calls a floor mat drying system. This protects the integrity of the floor while doing a very thorough job of drying without demolition. SERVPRO knows that the best way to eliminate mold spores in a home or business is by using containment and negative air. As you can see, we've used both in this picture to be certain this home is truly free of mold. Wall in units are a type of specialized drying technique that SERVPRO uses to thoroughly dry out a home or business in tough to reach places. This picture shows the hoses in the wall itself. Air is being pushed through to dry from the inside. Nothing is worse than coming home from a weekend getaway and opening your cellar door to this. 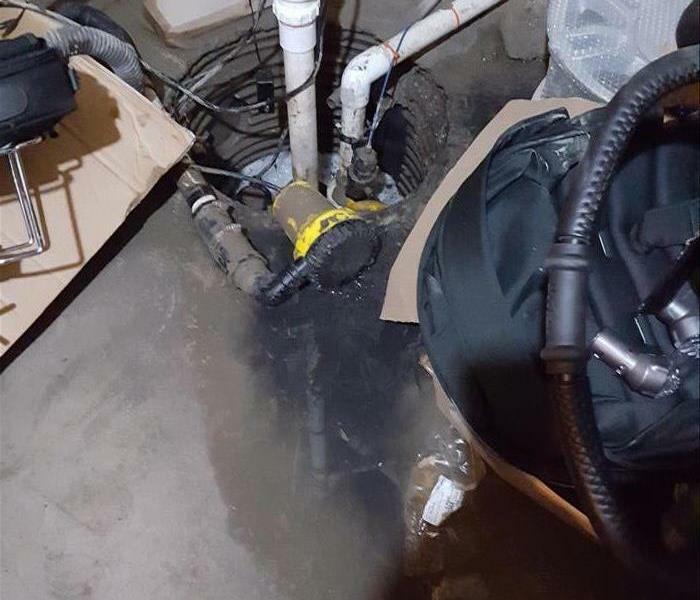 That's exactly what happened to this couple who had a sump pump failure after a wicked storm. 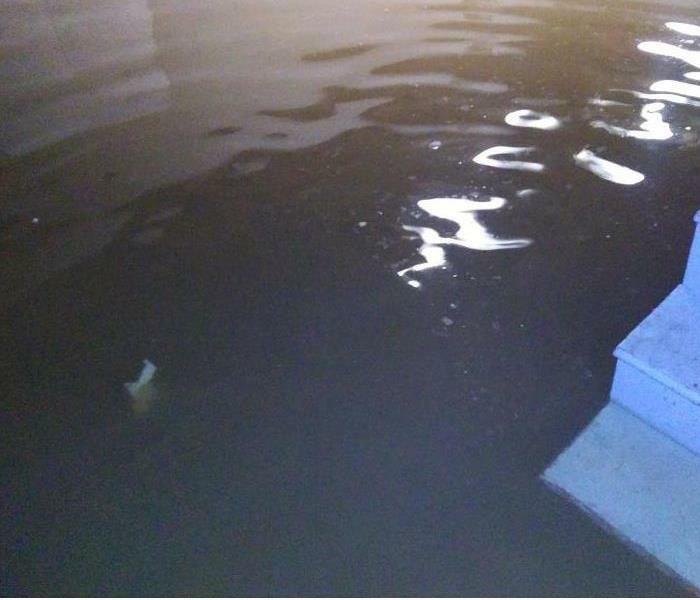 You come down stairs to find that your sump pump backed up and you now have a lot of water in your basement. But you saw an ad on TV so you give them a call. They show up immediately and begin to get to work. Now you know the answer to the question "Why SERVPRO?". The black mold seen here was found in a utility shed that was attached to the back of a home. Thankfully, it was self contained and didn't spread to the rest of the house! Any type of storm can prove hazardous and costly. If you don't have the proper insurance coverage, you find yourself paying out of pocket. 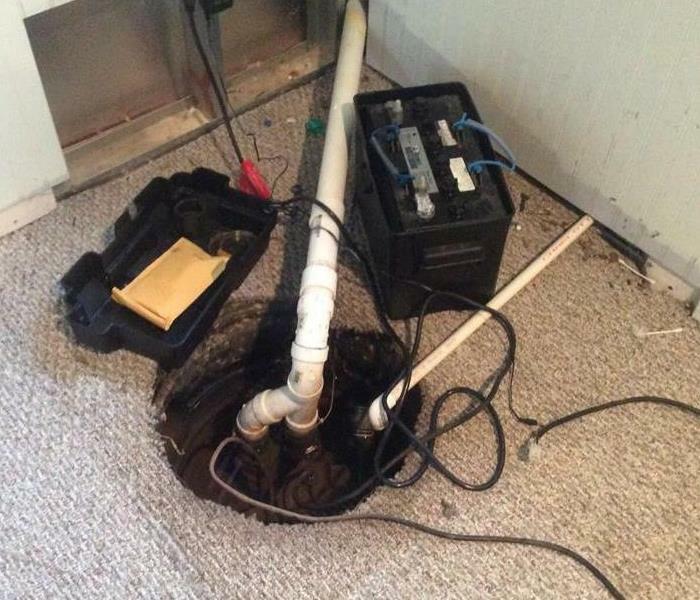 This picture shows a sump pump that failed during a storm. Washers are a modern technology marvel. No more going to the stream and using a wash board to clean our clothes. They do come with disadvantages though. This is the cause of loss in a clients home. The hose leaked and sent water into bedrooms and other areas of the home. it was quite the mess to dry out. 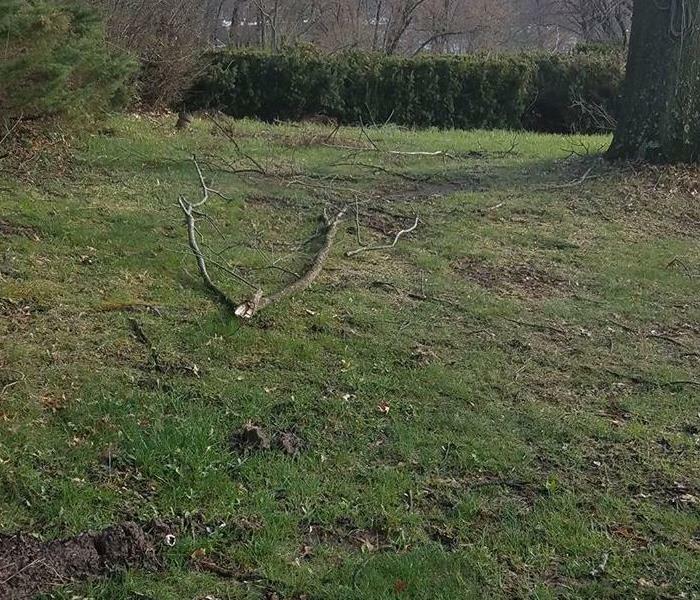 A small example of wind damage from a recent storm. Tree branches like these, can cause a myriad of problems if left unattended. This branch could have broken a window allowing water to intrude into the home. 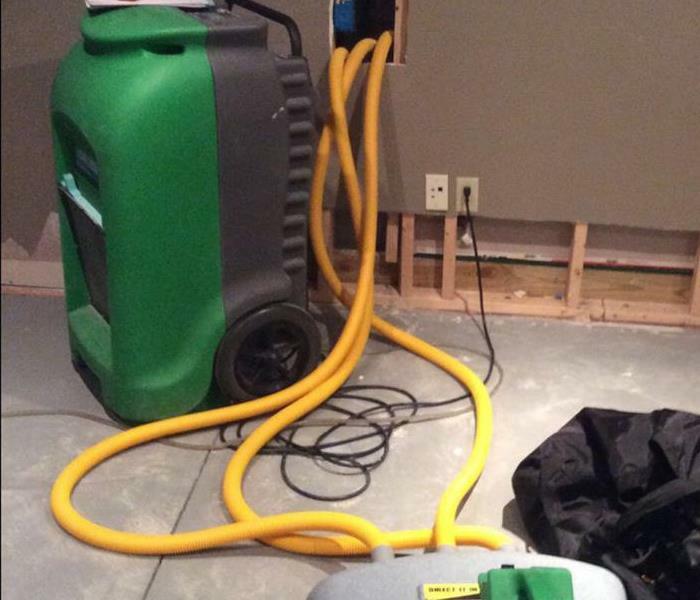 Air movers and dehumidifiers are the key to the drying out process. We see here, a conference room with a trash can in the middle and a hose running from the dehumidifier to empty the water. 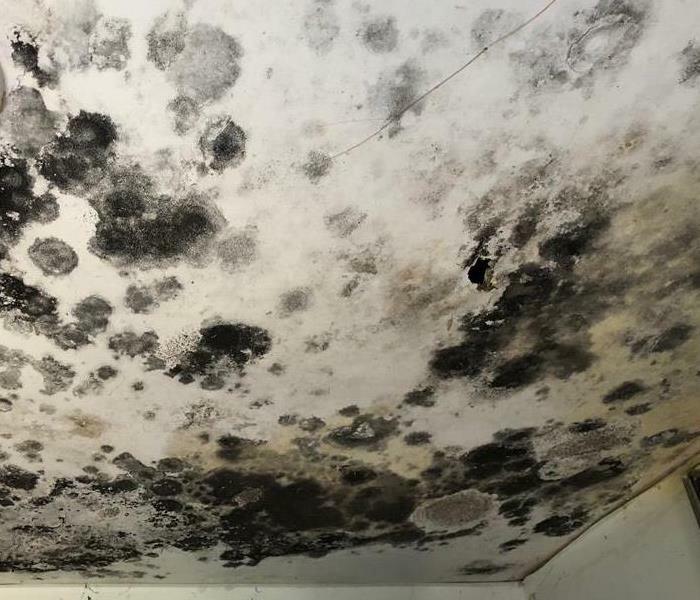 Dark damp and dingy areas are the prime location for mold growth. 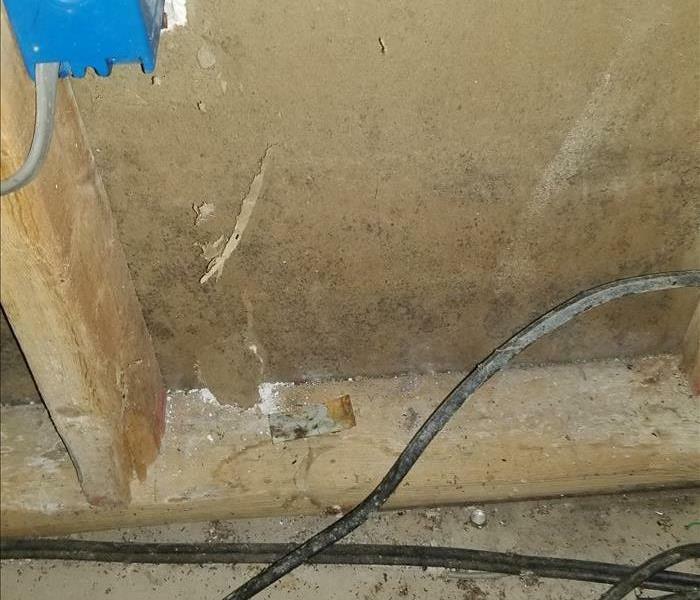 We can see in this picture, mold has begun to grow on the wires, wood and drywall itself. In this picture we see a wall in the finished basement of a home where residents used the basement as part of their everyday living quarters. 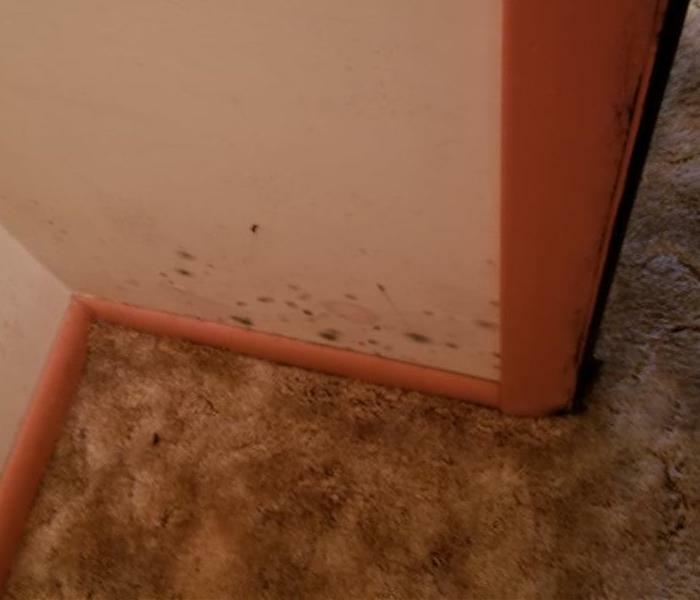 Basements are the ideal location for mold growth. 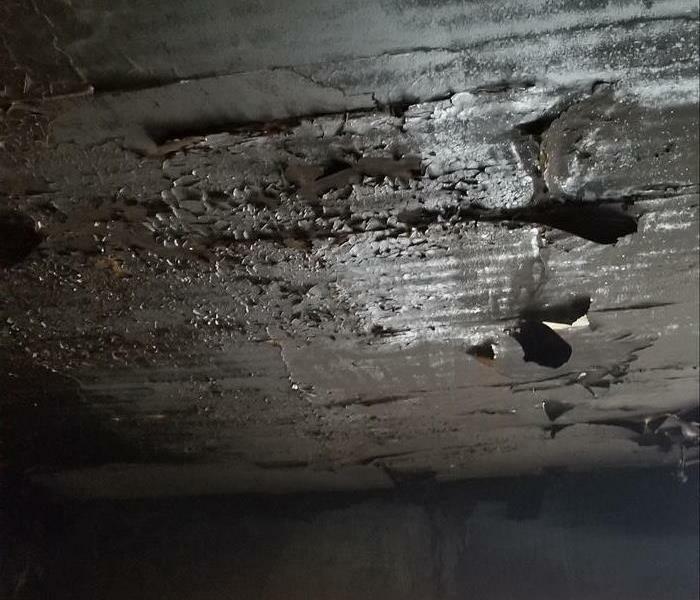 We can see the amount of soot accumulated on what is left of this ceiling. 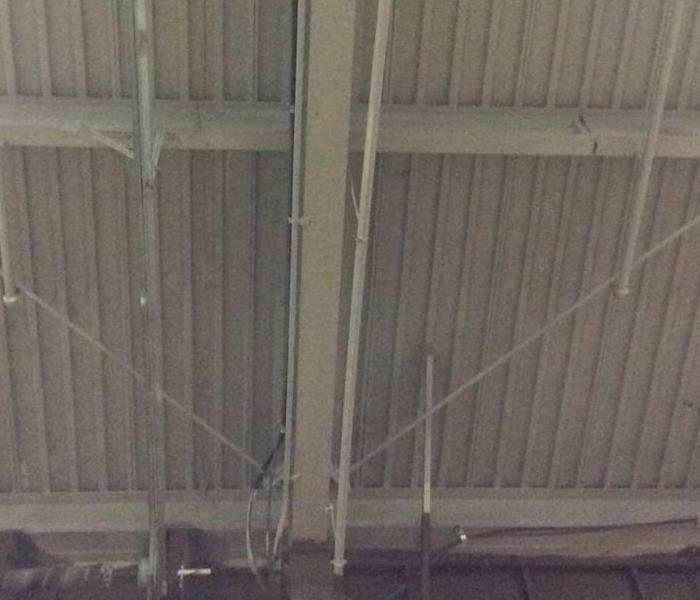 This could prove hazardous to anyone who is attempting to breathe in the area and or the roof could collapse. Fires burn hot and can rage for quite a long time depending on a few variables. How much oxygen they can get to continually fuel the flame, as well as how easy they are to fight from a firefighters perspective. 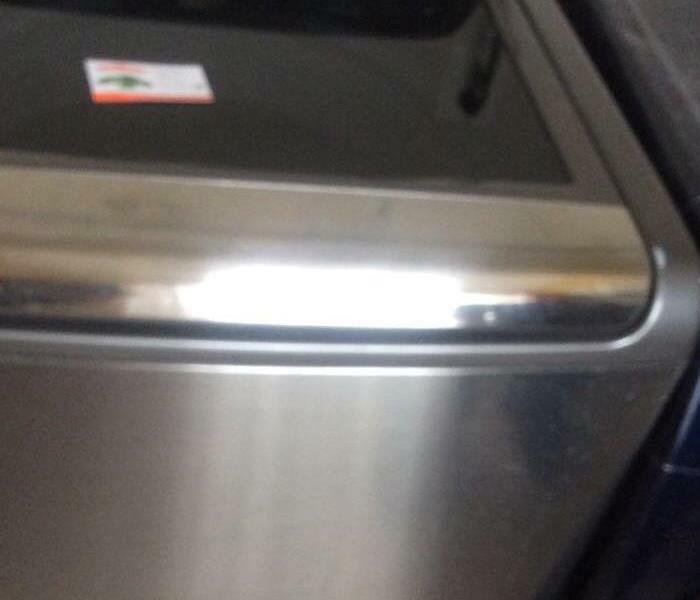 In this second picture, we see the delamination process at a better angle. Delamination is the secondary backing of the carpet pulls away from the primary. 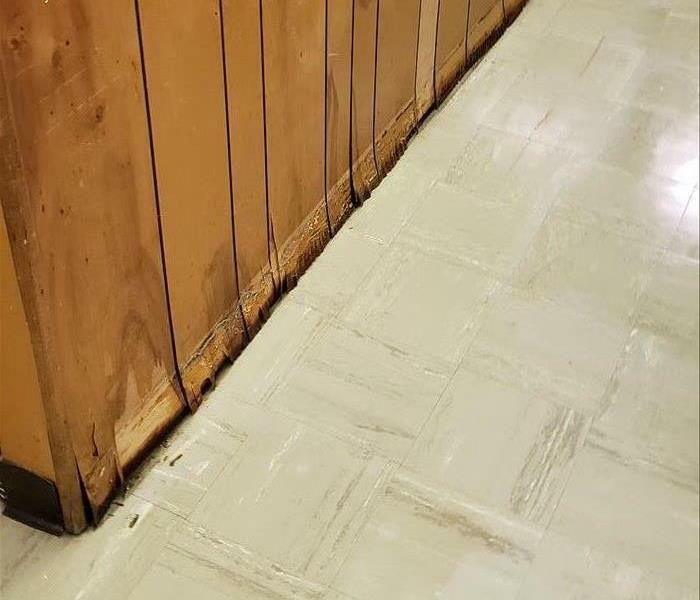 This can be caused by water damage, age, and just general wear and tear over time. When water from a recent storm got into the basement of this home, it did some serious damage. This pic shows the very beginning of a delaminated carpet. Delaminated meaning the backing. When a sprinkler pipe bursts, black water, initially, is released on everything in its path. In this instance, it happened at a big chain furniture store. We were able to contain the damage to a small area and the furniture was salvageable minus a few mattresses. With the amount of rain and snow we've had this year, it's easy to see that the ground is beyond saturated. We see in this picture a sump pump that failed due to overflow of rain water from past and more recent storms. 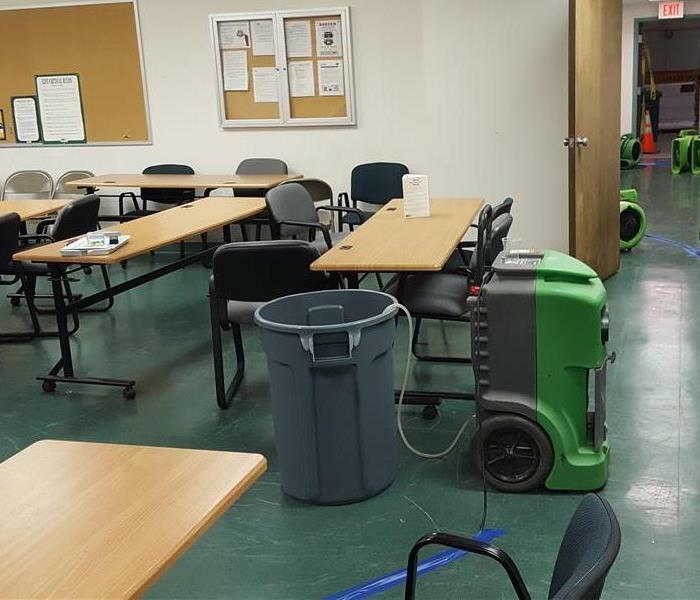 This picture shows our air movers and a dehumidifier that we are using to dry out and remediate a water leak that caused mold throughout the classrooms in a church. There are many steps to containing and abating mold. Mold can form anywhere at any time. Mold is not always black in color, as seen here. Any type of mold can cause health issues if not treated properly and in a timely manner. In this picture we can see the soot damage on the wall of a fire that began in the basement of a home. The fire went up the back staircases of the home to the second floor. This picture is of a recent fire in Reading that the SERVPRO of Pottstown/Souderton team just boarded up. The house is condemned and no occupancy is allowed at this time. The dry out process is efficient, but a little noisy. Here we see the reception area being dried out using multiple fans and dehumidifier. These machines typically run for 2 to 3 days. Whenever you have water damage of any type, you need to measure the amount of moisture in the air. In this picture, we see one of our technicians holding a meter and getting a reading. Here we see the damage caused by the leaking sink on the second floor. We had to do a complete demo and replacement of the drop ceiling. Lots of man hours were involved on this job. SERVPRO always takes pictures of the front of homes or buildings to be in line with the regulations of the insurance companies. This job took quite a few weeks to complete but the customer was very happy with the work! The remnants of a fire are always water and soot. Depending on the severity and the type of soot, items can be salvaged. In this pic, we see the door to a home that is covered in soot. After a fire, the most noticeable thing left over is the soot. 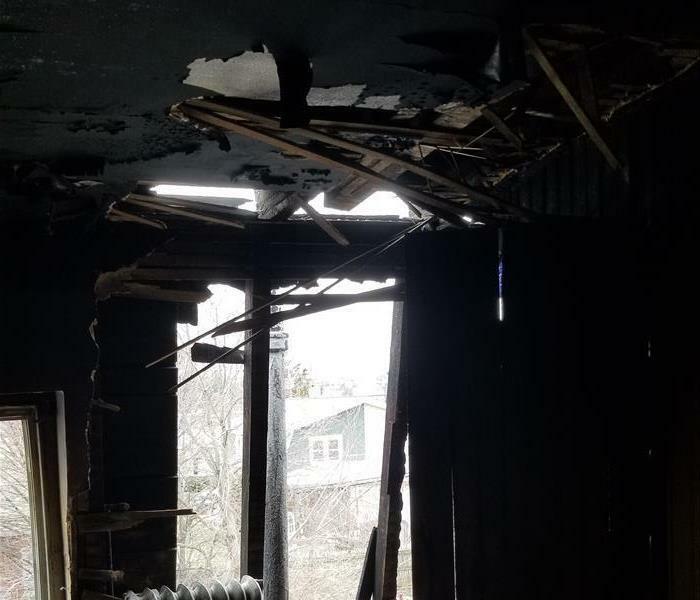 Generally, most things must be removed and destroyed but it depends on the severity of the fire as to whether or not anything is salvageable. In this picture, we see the entire floor and walls are covered. This prevents the mold spores from spreading and keeping it contained to one area. If you experience mold of any type, please don't hesitate to call us. In this picture, we see where the SERVPRO team has placed plastic over the entire gym floor and part of the walls in order to contain the mold during the abatement process. From the outside of this beautiful church, all seems perfectly fine. 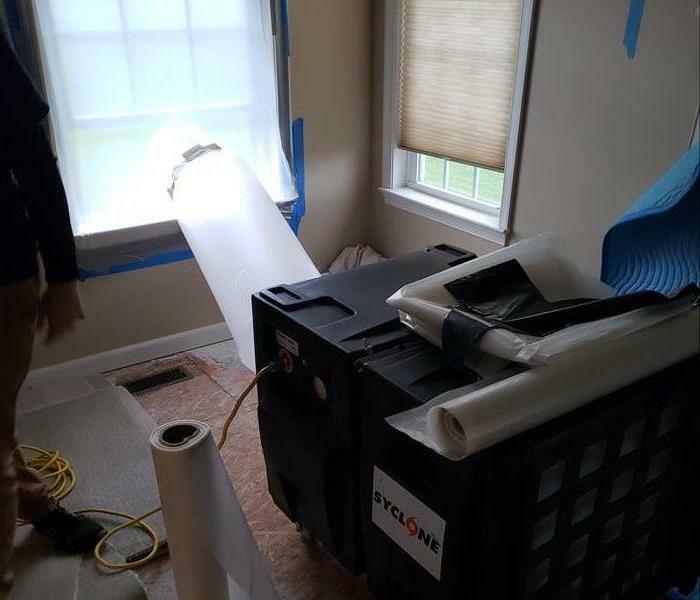 Let's take a look inside to see how SERVPRO of Pottstown/Souderton crew went to work to mitigate and get everything back to "Like it never even happened." SERVPRO of Pottstown/Souderton is tenting the hardwood floor for drying with white plastic and with e-tes thermal dryers and dehumidification. The air is heated and then blown into the area for superior results. Here we have another photo of the tenting process. Perfectly in place. This picture shows several air movers drying underneath some of the radiators of the church where water was present. This is one of our most effective drying methods for reduced drying time. This photo demonstrates more tenting within the church for hardwood floor drying. This is a dry and complete picture of the beautiful flooring post water damage. One of the after pictures of this beautiful church. 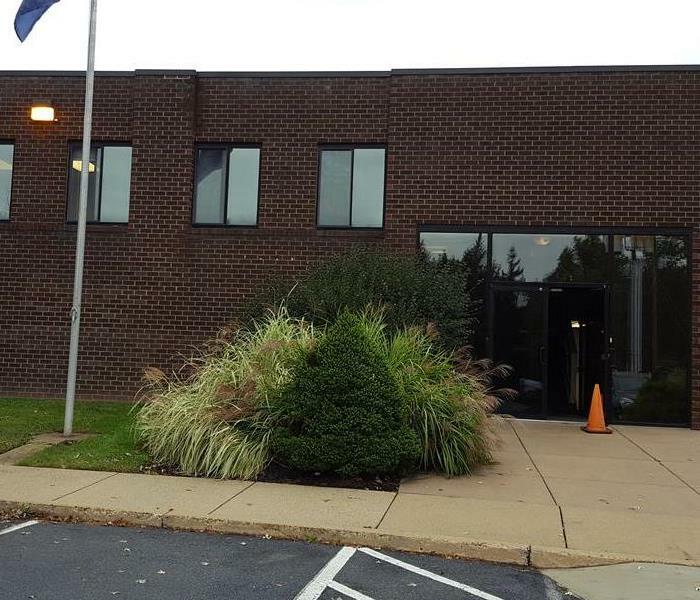 Here is a gorgeous view of the inside after SERVPRO of Pottstown/Souderton was finished. Here is another after pic once SERVPRO was done with the entire process. It doesn't even look like there was any water damage in this picture. The customers and the SERVPRO staff were very happy with the results. Looking from the back of the church - after pic!